$80 Kindle Paperwhites, a massive Gold Standard protein sale, and the best deal we’ve seen on a weighted blanket lead off Wednesday’s best deals from around the web. Giant plugs that cover up half the outlets on your power strip should be outlawed, but until that day arrives, these short extension cords will have to do. $16 gets you a pack of 10 (with code 3Y82IACD), which should be enough for even the most advanced home theater setups. If your home still isn’t fully Alexa-enabled yet, you can change that with this smart home-friendly Echo Plus. It has all the regular Alexa stuff - play music, make calls, set timers and music alarms, ask questions, check traffic and weather—plus a multi-talented smart home hub that can control a bunch of different smart home gadgets natively, including the included (!) Philips Hue white bulb. It’s down to just $100 today, or $50 less than usual. This car charger is one of our top selling products of all time, and it’s easy to understand why. It’s cheap (just $6 today with code L5RMWTR8), it’s tiny, and it can charge two devices at 2.4A simultaneously, which is important when your phone is also playing music and giving you turn-by-turn directions. Just note that the base Fire 7 only includes 8GB of storage, and the 10" has 32GB, but you could expand either of them with a discounted microSD card. Weighted blankets can work wonders for your anxiety, and you can score an all-time-low price on this 15 pound blanket from Amazon today. They’re just $61 with promo code YKHY7HK3, making this the best weighted blanket deals we’ve ever posted at that weight and size. Not to stress you out, but we wouldn’t expect this deal to last for long. This has been my personal kitchen trash can for several years now, and I love the thing more than anyone should be allowed to love a garbage receptacle. It looks great, the pedal mechanism is rock solid, is does a good job of containing, odor, and the inner lining makes it easy to remove a bag and add a new one. Update: This particular one went up to $40, but Walmart has a different model down to $30 today. Our readers have purchased thousands of Miracle-Gro Aerogardens over the years, but if you’ve outgrown your little countertop vegetable patch, the AeroGarden Farm is what you need to expand your indoor harvesting ambitions. The Farm is basically a gigantic (the size of two tall kitchen trash cans placed side by side) version of the AeroGarden, complete with smartphone control, plus two LED grow lights with adjustable heights, so you can dedicate one side to smaller herbs, and the other to taller vegetable plants. Despite the size, it still uses the same AeroGarden hydroponic seed pods as the countertop models; it just accommodates a whopping 24 of them at once. $548 is a lot of money, obviously, but that’s easily an all-time low, and about $150 less than usual. Do you really love espresso? If the answer isn’t a resounding yes, then this is not for you. Maybe go buy some wine instead. For those of you who are still here, let me tell you about an espresso machine that makes cafe-quality espresso that won’t require you to spend $5,000 and dedicate an entire wing of your house to espresso making. The Breville Dual Boiler fits on your countertop and extracts your espresso at the perfect temperature while rising the pressure level slowly, producing balanced, not bitter espresso. Plus, the dual Italian pumps allow you to brew espresso and steam milk simultaneously. Unlike cheaper models, this one is upgraded with an LCD screen that displays water temperature, the shot clock, and the time. Now, let’s talk price. It’s down to $980 today, a rare discount below $1,000. Is that a lot of money? Yes. But, if you really love espresso and care deeply about drinking quality caffeine, then it could be worth it. You don’t have to empty your wallet to score a really nice wallet from Fossil. Eight different men’s leather wallets are on clearance right now for a mere $19, plus free shipping on all orders. What better way to get ready for fall weather than up to 40% off at the Under Armour Outlet? Pick up workout shirts, sweats, leggings, shoes, and more, with $5 standard shipping, or free shipping on orders over $60. Alice + Whittles is the footwear brand that made us rethink rain boots entirely, showing us there’s style to be had with functionality. Right now Alice + Whittles is having a We Made Too Much sale, marking down all of their pastel ankle boots from $160 to just $75. Choose from colors dusk, coral, pink, and blue. Good morning! 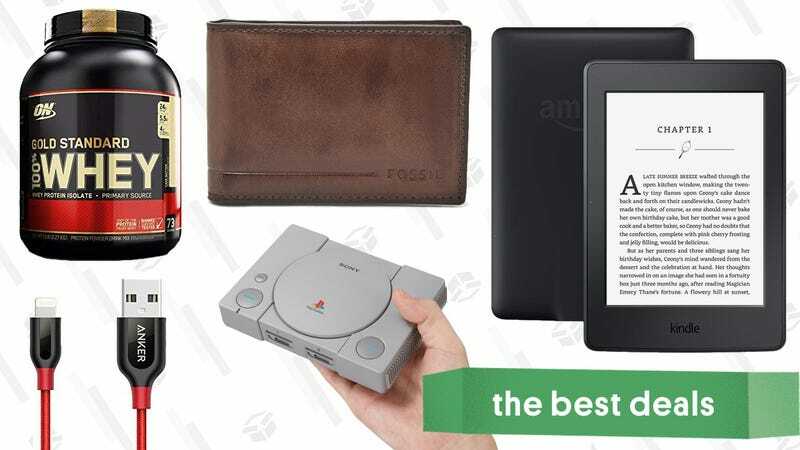 The PlayStation Classic is a thing that exists, apparently, and it’s up for preorder now for $100. It comes with two controllers and 20 preinstalled games, so what are you still doing here? LEGO’s Star Wars advent calendar only just went on sale for 2018, but Walmart’s already taking $5 off its $40 price tag. As always, it features 24 tiny Star Wars-themed LEGO gifts, including brand new ones for 2018 like a snowman in a Rebellion helmet, a Rose minifig, and tons of miniaturized spaceships and speeders. Note: This was $33 when we first posted it, and has since risen to $35. But that’s still $5 less than elsewhere. The Banner Saga 3 finally came out a few months ago, but if you haven’t played the first two hand-drawn strategy games in the series, your best bet is to buy the complete the Bonus Edition trilogy on PS4 or Xbox One. Normally priced at $40, it’s marked down to $30 for the first time today on both consoles, with an additional $.61 coupon available on the PS4 copy.